Just a reminder that we'll be closed Easter Sunday. 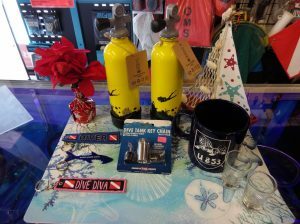 USED & NEW SCUBA GEAR!! That’s right on Saturday 4/20/19, Dive On It Scuba will be having a 4/20 sale!! If the rain holds off, we’ll be outside! If not, sale items will be displayed in our classroom. Come on down and give some of this gear a new home! Save $1500 on the Hollis Prism 2 Rebreather! Amazing Promotion now till April 30th on a complete kit! Your choice of front or back-mounted counter-lungs. $7500 (normally $9k) not including tanks (2 required, 2L or 3L size) or training (required if not already certified on the P2). Stop in or give us a shout if you're interested. Orders must be placed no later then close of business on the 29th of April to qualify for this offer. This is the ideal time to go bubble-free and massively extend your bottom time! Even without going into Deco! The Prism 2 will give you optimum PO2 during your dive giving you substantially longer NDLs on your regular dives, plus upto a 4hour runtime on the scrubber! Like diving in cold water? The Prism 2 is ideal! Since you're breathing warm air instead of cold compressed gas you'll be much warmer on your dives and the Prism 2's scrubber assembly is optimized to perform very well in cold water. Chris made PADI Elite Instructor for 2018! Our team from the TRP fundraiser inhaling 100 wings!